Phew. I’ve finally finished the first CC-20 beta and fitted it into a case. I can now sit back, look at it and listen to it! In this post a few weeks ago, I showed the unpopulated board with the connectors lying on a sheet of the red PCB material I was planning to use to fabricate an enclosure. By the way, the 6 pin connector you can see at the bottom of the board in the center in the photo in that post is one thing that makes this rig different from many others. It is marked ICSP, which stands for “In-Circuit Serial Programming”. 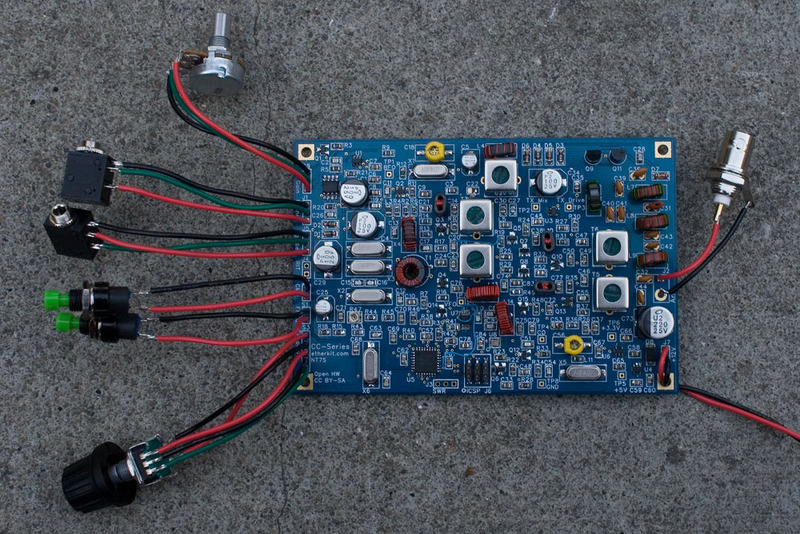 Etherkit bills itself as an open-source amateur radio company and the hope is that code-minded amateurs will write their own code for this rig if they feel they can add features, or improve on the code that the micro-controller in the kit will come programmed with. If you don’t write code, by the time the kit is available to the general public, the stock code will be solid, so no need to worry if, like me, you’re the type of person who needs others to write your programs for you. I did build a USBtinyISP so that I could flash the firmware on my beta though – the beta kit was shipped to the testers with a version of firmware that is not the final version. 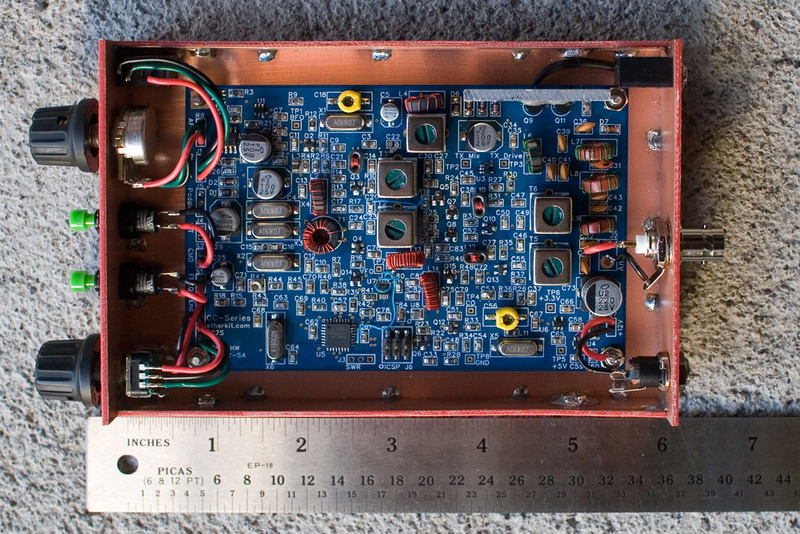 Before we go any further, just in case you’re wondering what the CC-20 is, it’s the first transceiver in what will be known as the CC-series, designed by Jason NT7S. These are a series of monoband trail-friendly QRP CW transceivers with a DDS VFO, superhet receiver with 3 pole crystal filter, and TX that puts out about 2W. The kit makes copious use of SMT devices. If you’re good at soldering, have reasonable eyesight and a steady hand, you should be able to assemble this kit, but I wouldn’t recommend attempting it if you have never soldered SMT parts before – it would be best to get your practice on a smaller and easier kit (I built 2 KD1JV Digital Dials, which also uses SMT devices, but is a much simpler project, taking less time to complete). Of course, the first thing to do after completing the board was hook it up to a paddle, earbuds and antenna, and see if it would work. The first QSO was with W7VXS in the Salmon Run. 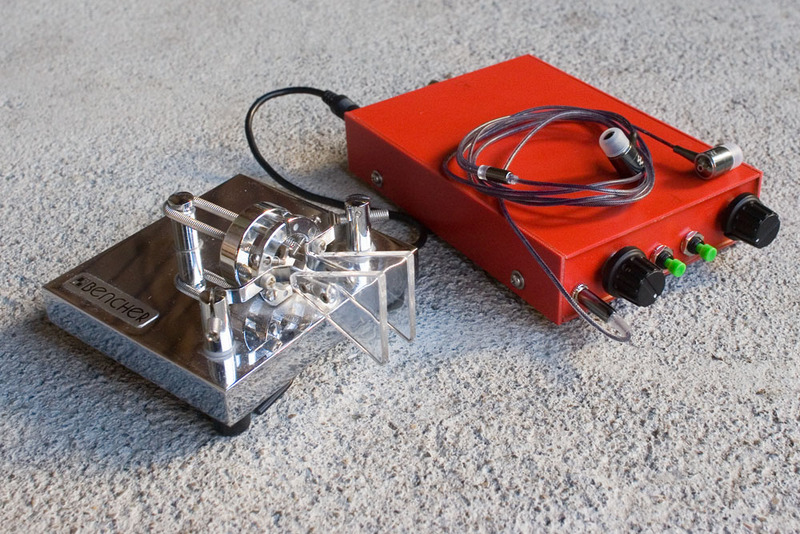 I then rattled off 8 more Salmon Run QSO’s – looks like this little rig works! I also had a regular QSO with K1CTR in Denver, CO.
At some point afterwards (I think it was during an extended key-down period while tuning the TX) the finals overheated and fried. The production version will have a redesigned driver and finals and will most likely have an automatic dotting mode programmed into the firmware to prevent overheating of the BS170 final transistors. For this version of the rig however, to help guard against this happening again, I epoxied a small chunk of aluminum to the new finals to act as a heat-sink. Oh yes. One thing I almost forgot to mention is that after fitting the new finals, I called CQ on 14061 and was replied to by Steve the Goathiker WG0AT. Now that’s a good omen! Mikey WB8ICN, Paul K3PG and Brian N1FIY are getting close to finishing their CC-20 betas, and I’m looking forward to comparing results. Mikey has already finished the receiver part of his, and our results are similar. There are a few issues with the first beta that Jason will be working on to fine-tune. This, of course, is the whole purpose of beta-testing. I was also thrilled to hear that John AE5X will be joining us for the second round of beta testing. I think we will also have one or two more beta testers joining us for the second round, but I’m not sure who they are. In the meantime, I now have 20M capability and this little radio is fun to operate. Thanks Jason! Posted in Amateur Radio, Ham Radio, QRP.Tagged AE5X, CC-20, Cc-20 beta, etherkit, NT7S, QRP trail friendly radio, trail-friendly radio, W7VXS, WG0AT. Thank you Robert. I’m still learning how to make these enclosures and made a few mistakes with this one. It’s not quite as perfect as it might look, but I’m still fairly content with it. I’m impressed with the case too! Perhaps you could share the technique one day. What do you use to cut the PCB material so the edges are so clean and straight? One extra thing to add – when preparing to flex the board in order to create a clean break, if the piece is too small (and there are a few small pieces in the case for the CC-20), you won’t get enough leverage by attempting to sandwich one end between 2 bits of wood, so I covered one side of the board in paper for protection, grasped it with a pair of pliers, and flexed it gently in several places along the length of the board until it broke off. It helps to cut the board pieces a little larger than needed (about 1/16″) to give you a bit of leeway when sanding the edges down. That way, you get a nice smooth edge and also the correct fit. 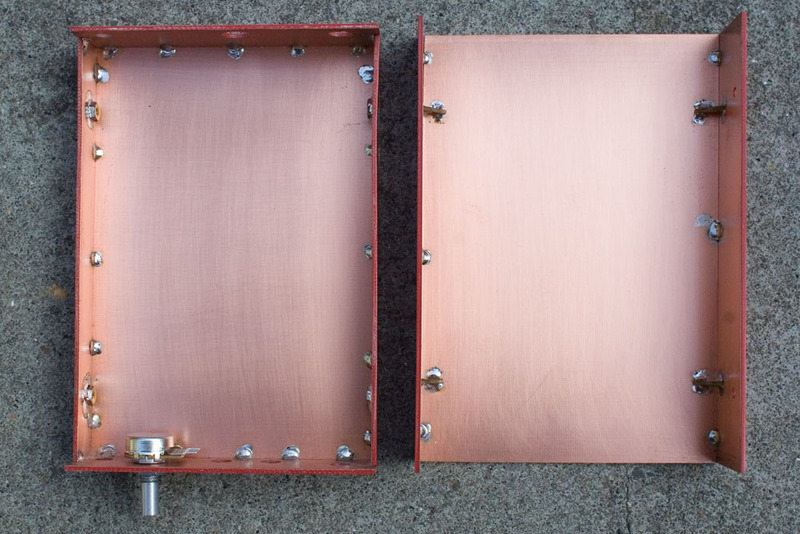 Building PCB enclosures is a very time consuming process in my experience, and I’m not sure if I have the patience to make any more in the near future, so may well be looking for ready made enclosures for future projects. Very nice looking kit. 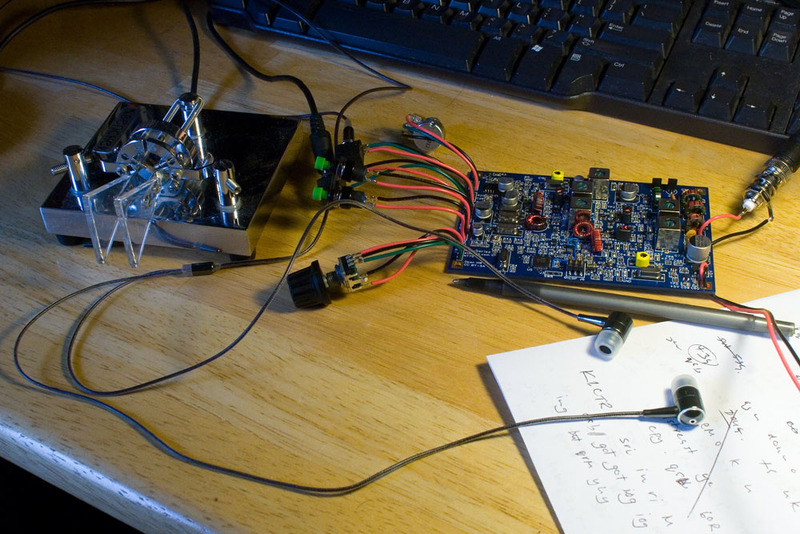 I built the SMT kit a few years back, and the smt components were really tough to deal with. But I probably could do it again, given a bit of time and patience. Where do I find out more about this kit? I looked at Etherkit.com, but there does not seem to be much info there. Looks like $40 for the board. How much will the entire kit be? 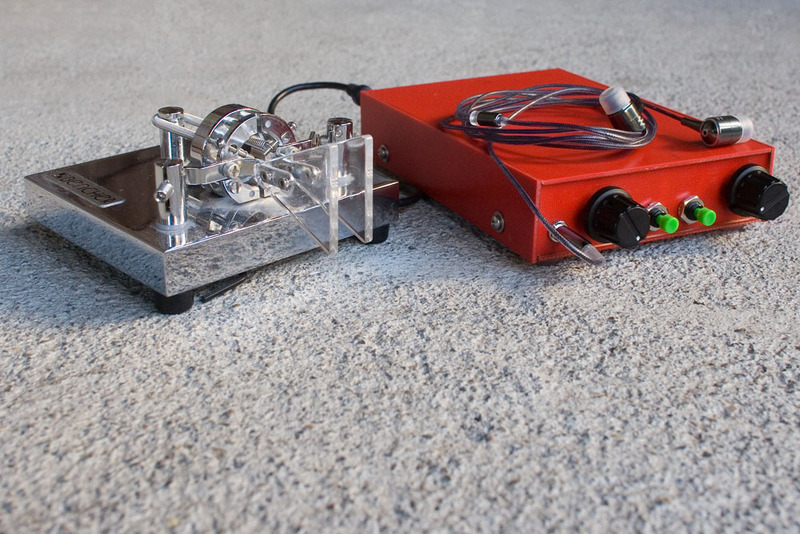 The red laminate makes for a stylish and quite sleek enclosure, and the blue pcb looks mighty fine also. 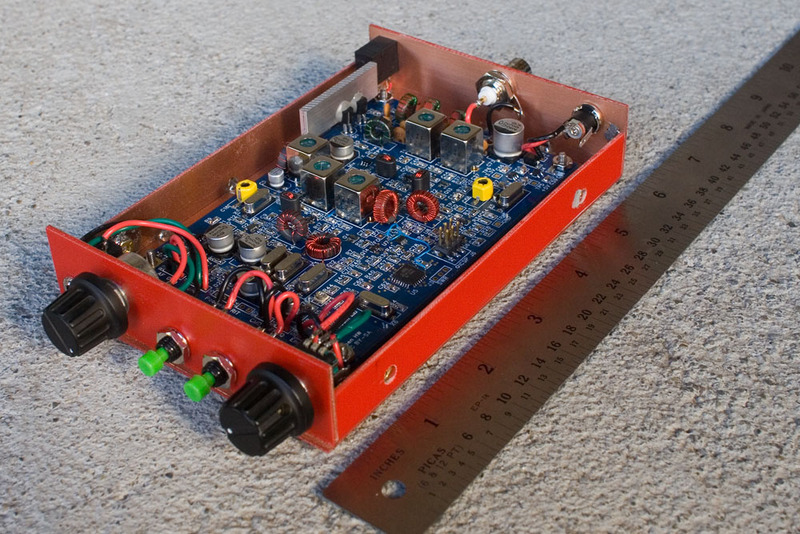 Here’s hoping 2012 will be the year that I crank out a CC-40 or CC-20 in the shack!